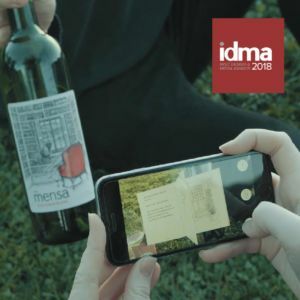 Mensa, South Africa’s first wine supported by an augmented reality app, has been lauded for innovative artwork and packaging at the 2018 International Wine & Spirit Competition (IWSC) Design & Media Awards in London. Rewarded with a Silver medal for wine artwork and bottle design at this new international competition, Mensa joins the global ranks of the world’s most celebrated wines for innovation, creativity, artwork, bottle design and packaging. The award winning Mensa range just launched by Overhex Wines International, takes storytelling and consumer engagement to the next level through digital innovation and design. “International recognition for our label design and use of cutting edge digital technology shows us yet again that we are on the right track with our innovative Mensa range,” says Gerhard van der Wath, owner and chairman of Overhex Wines International. Mensa wines are available countrywide and can be purchased online or at the Overhex Winery & Bistro outside Worcester. For more information visit www.mensawines.com, or follow MensaWine on Facebook and Instagram, and @mensa_wine on Twitter.